The name of Raeville is derived from Thomas and James Rae, who came from Canada and settled two miles south of Petersburg, about 1871. The tract of land, about ten miles long and four miles wide, stretching north from the Rae place, was called Rae Valley. A postoffice established on the tract at the Salber place (now the Dr. Warden farm), was known as the "Rae Boys' Post Office". The name was eventually shortened into "Raeville". the beginning these settlers had to drive to Columbus, the round trip taking four to five days, to market their produce and purchase supplies. By and by other Catholic families settled around these pioneers. They were the Velders, Schultes, Koesters, Schmidts, Bremers, Chavanus, Vanden Ankens, Kricks, Andres, Bodes, Clemenz, Buelts, Baumgartners, Corkles, Beckmans, Halburs, Hecks, Heithoffs, Grundmayers, Forthaus, Greitens, Jostens, Kreigenbecks, Kraemers, Kents, Lohoffs, Lampmanns, Lordemanns, Martins, Mosers, Morisses, Optenwinkels, Pelsters, Rueths, Ruloffs, Pfeifers, Reiks, Schliffs, Schrads, Shaefers, Schroeders, Stuckis, Temmes, Seirs, Thiemanns, Vanderheids, Waldmanns and others. When the present Northwestern Railroad was built in 1886 the railroad company planned three stops between Albion and Oakdale, the first to be at Loretto, the second at the Catholic settlement of Raeville and the third two miles north of Elgin. The Loretto station materialized, but the people of Raeville, guided by their pastor, Rev. Bonaventure Faulhaber, O. F. M., feared the demoralizing influence of the element coming with the railroad and voted against a station. The railroad company thereupon availed itself of the offer of Mr. John Peters, county clerk at Albion, and located a depot on the Peter's farm, 31/2 miles southwest of Raeville. It was named Petersburg. The next station was then located at the present Elgin. As a result Raeville was without a railroad station and even the postoffice was discontinued and transferred to Petersburg. The name Raeville, however, clung to the Catholic settlement. This shortsighted policy of the Raevillers was keenly felt later on, especially when 340 loads of material for the new school had to be hauled four miles over wintry roads. Finally, the tireless efforts of the present pastor, the Rev. John B. Frigge, succeeded in 1917 to obtain a railroad station. From this dates the rapid development of the town and community of Raeville. The forty acres donated by the Rev. Nicholas Horn were platted, lots were sold, a bank organized; a general merchandise store, a garage and a grain elevator erected and the old postoffice of Raeville was revived. Still, for many years, the railroad facilities were far from satisfactory until the state railway commission forced the Northwestern R. R. to replace the old box car station with a structure accommodating at least fifteen persons, with adequate freight shipping facilities. In 1911 Raeville consisted of a Catholic church, a parochial school, a store and postoffice, with about six residences nearly half a mile from the railroad and five miles from Elgin. A few years later there were twenty-six residences, with a population of one hundred. The business credited to Raeville had grown to be valued at $25,000 a year. The first Catholic service was celebrated at Raeville by the Rev. Wunibald Wolf, at that time pastor of Crete, Saline county, Nebraska. Mass was said in the Bremer sod house. At the request of the Rt. Rev. Vicar Apostolic James O'Connor, Father Wolf, despite many inconveniences, willingly visited Raeville three times in summer, 1881, and may be called the founder of the parish named in honor of St. Bonaventure, Cardinal and Seraphic Doctor. Even greater credit is due to the Rev. Nicholas Horn, pastor at West Point, who, in 1882, was given charge of Raeville as a mission, with directions to build a church. Although still very poor, all families contributed their mite towards the erection of the house of God. 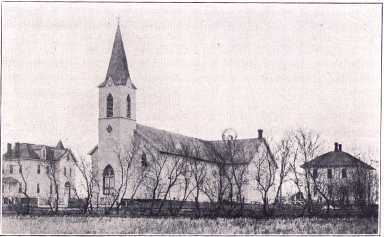 Father Horn purchased forty acres of land, erected a small church, 24x36 feet, said there the first holy Mass, February 15, 1882, and attended Raeville faithfully about once a month, always on a week day. For he had many missions to attend to. Father Horn came by train as far as Oakdale, where the people, with a lumber wagon, met him, to take him to Raeville. On such a trip in the slow creeping wagon, Father Horn contracted a severe cold, which caused, or at least accelerated his death, which occurred a few days later at West Point, A. D. 1884. During the rectorship of Rev. Horn a party proposed to move the church nearer to the present site of the railroad tracks. Mr. N. Henn offered to donate ten acres of land for church purposes. Father Horn and the farmers located to the southward opposed this move, and to end the controversy, Father Horn donated his forty acres to the congregation. Rev. Nicholas Horn was born near Mayence, Germany, 18--, studied at Maria Laach and Stonyhurst, was ordained priest October 24, 1877, at St. Philomena's cathedral, Omaha, and was appointed pastor of West Point, St. Charles and Glencoe in 1877. During his pastorate at West Point he wiped out an indebtedness of $1,800, installed new pews, stations of the cross, etc., and built an addition to the church which served as a sanctuary, sacristy and pastoral residence. He also acquired and laid out the cemetery, bought in 1883, on one-fourth of a block for a school, laid the cornerstone November 1, 1883, and died soon after. While pastor of West Point, Father Horn also attended St. Charles, Glencoe; Wisner, where May 7, 1879, he laid the cornerstone for the church; Scribner, Ridgeley (where he also supervised the erection of the first church), and Raeville, Wayne and the whole of Burt county. He erected the first church at Decatur and said the first Mass in it on December 20, 1882. Another church he erected at Bancroft and said the first Mass therein November 5, 1882. His motto seems to have been: "Work while it is day, for the night cometh, in which you can work no longer." Weakened by exhaustive labors, a cold, grief and typhoid malaria fever, Fr. Horn passed to his heavenly reward May 26, 1884, in the odor of sanctity. The Rt. Rev. Vicar Apostolic, who considered Fr. Horn as the most commendable priest in the diocese, came to West Point to officiate at the obsequies. He wept bitterly and being suddenly taken ill, returned to Omaha and Rev. Lechleitner officiated at the funeral. After the premature death of the saintly Nicholas Horn, the Rt. Rev. Bishop O'Connor charged the Franciscan Fathers of St. Bernard with the care of the Raeville mission. For owing to scarcity of priests, Raeville had been neglected for a time, as Mr. Joseph Schlipf in a letter dated August 10, 1884, writes to the Rt. Rev. Vicar Apostolic. There were 40 families in St. Bonaventure's parish. No priest had visited since the death of Father Horn and all were suffering from the lack of one. The Catholics of the community, even the children, were becoming careless in religious matters like their Protestant neighbors, many had begun to work on Sundays. "For the sake of religion," entreated Mr. Schlipf, "send a priest into our midst." As a result the Franciscans were entrusted with the care of Raeville. REV. MAXIMILIAN KLEIN, O. F. M.
Rev. Maximilian Klein, O. F. M. (died in January, 1931), who was in charge of St. John's, Joliet Township, Platte county, and of St. Leonard's at Madison, came from St. Bernard mostly on a week day "to do the best he could" for the Raeville Catholics. Seeing how eager and appreciative the good people were for the visit of a priest, he came about once a month. From this time on Raeville has its on church records. On September 23, 1884, Fr. Maximilian baptized Louise, daughter of Mr. and Mrs. Hy. (Elizabeth) Schaefer, born May 1, 1884, the sponsors being Wm. and Mary Schmidt. On the same day he christened Antonia Henrietta Temme, born September 8, 1884, the godparents being John Velder and Matilda Clemenz. On October 16, 1884, the same Father officiated at the first marriage recorded at Raeville. The contracting parties were: Theodore Goeres and Mary Schroeder. Wm. Peter and Elizabeth Schroeder were the witnesses. On July 18, 1886, Wm. Cramer, Ludwig Schmid, Wm. Koester, Joseph Clemens, Frank Stucki, Catherine Schroder, Anna Schulte, Anna Koester, Johanna Seir and Ludwig Krick made their first Communion. The first death was that of Anna Caroline, a child of Joseph and Anna Maria (Ruesch) Baumgartner. Of the hardships of the long trips per wagon (due to bad weather and poor roads) to and from St. Bernard, a distance of 25 or 30 miles, little need be said. When Father Maxmilian Klein was transferred to Ashland, Wisconsin, the Rev. Luke Miersowski, O. F. M., (July 19, 1886-February, 1887), came to fill the vacancy. He was, however, called after six months to Radom, Illinois, to take over some Polish mission. His successor at Raeville and two other missions was the Rev. Bonaventure Faulhaber, O. F. M.
REV. BONAVENTURE FAULHABER, O. F. M.
On May 19, 1887, the Rt. Rev. Bishop J. O'Connor confirmed at Raeville a class of thirty-five. must agree before work could commence on the church. The Annual Report, out in November, 1887, by Rev. Bonaventure Faulhaber, O. F. M., pastor of Raeville and Albion, said that Raeville was a town in Boone County, which he attended 3 to 4 times every two months; 42 miles from the St. Bernard Parish; 46 Catholic families. Remark 1. Several Irish families in the neighborhood are not included in the 46 families. There are two families and one single man, whose names we did not take (down) into our census book, since said families pretend to belong to some other, though distant, parish. Rev. Luke Miersowski, O. F. M. Raeville, Neb. of age; none not practical; Catholics under 21 years, 48; children attending Sunday School, 40 to 55; children attending school, 35. Remark 2. Our district school is, with the exception of two American (Yankee) families, exclusively German-Catholic--though it has no parish school. Remark 3. It seems that quite a few people received Holy Communion at Paschal time, and thus, to the present pastor, a newcomer, it is not quite evident, whether all received at Easter." So far the report of Rev. Bonaventure. Joseph Faulhaber was born in Koenigsheim, Amt Tauberbishofsheim, Baden, Germany, March 28, 1842. His parents were Adam Faulhaber and Marianna Michel Faulhaber, farmers of moderate means. Joseph frequented the elementary school of his native town from his sixth to his fourteenth year, and, after receiving private instructions from his pastor, Father George Karl Rueckert, entered the "Unter-quarta" of the gymnasium at Tauberbishofsheim, frequenting the place for four years. After finishing at the gymnasium he was advanced to a year's study at the lyceum of Constanz. Later he went to the University at Freiburg, in Breisgau, but, as he said, "deficiente pecunia", and on account of other circumstances, he was compelled to give up studies and apply himself to agriculture on the farm of his parents. He was then drafted for the German Army, but was released on account of shortsightedness. On August 29, 1865, Joseph Faulhaber left his home for America and landed in New York on October 1st. Looking for work, he travelled (sic) to Cincinnati, and then to Covington, through Indiana, Northern Ohio and Pennsylvania. Hard work, sickness and harsh and unjust treatment were his lot. For eleven weeks he worked as a railroad hand in Pennsylvania. Finally, from June 13 to July 27, 1867, he became a patient of St. Mary's Hospital, Cincinnati. Here he made the acquaintance of Father Hoffmans of Teutopolis, Illinois. After he left the hospital, Joseph Faulhaber began work at St. Ferdinand, Indiana, as a helper for $1.00 a day. The priestly vocation was attracting him, and finally he came to Teutopolis with a fine recommendation from Rev. J. Chrysostom Toffa, O. S. B., dated at St. Ferdinand, Indiana, August 24, 1868. The habit was given to him on December 27, 1868. He made his solemn profession, January 1, 1873, and on January 6th was raised to the holy priesthood in St. Louis, Mo. After his ordination Father Bonaventure was assigned to the following places: 1873 to Cleveland; 1875 to St. Louis; 1881 to Cleveland; 1887 to St. Bernard; 1892 to St. Louis; 1894 to Teutopolis; 1895 to Indianapolis; 1896 to St. Louis; 1897 to Chilicothe, where he suffered a stroke of paralysis and to Quincy in 1901, where he had charge of the hospital. of whom were lukewarm. Father Faulhaber went about the Bohemians, collected some money and paid for the little church. He even learned their language, that he might be able to preach to them and instruct them in their own tongue. He wanted to be as St. Paul: "All to all, to gain all for Christ." The retreats, which he gave frequently for many years, were highly valued. A continual study of Sacred Scripture also in the original text--since he was well versed in Hebrew--enabled him to cite from memory innumerable texts in his retreats. He was a true consoler to the sick and extremely careful about their eternal welfare. Many sinners surely owe their eternal salvation to the efforts, prayers, and mortifications of Father Faulhaber. Everywhere he recommended the Archconfraternity of the Holy Rosary and the Confraternity of the Immaculate Heart of Mary for the Conversion of Sinners. He was ever anxious to gain as many indulgences as possible for the poor souls in purgatory. Sufferings and rebukes did not fail to block the life of this saintly man. Humiliations that he frequently encountered established his virtue on a solid basis. In all trials he ever rose to the standard of a saint. His death, precious in the eyes of the Lord, occurred on April 29, 1907, in St. Mary's Hospital, Quincy, where he had been Chaplain during the last years of his life. He is buried in Calvary Cemetery, Quincy, Illinois. All who knew Father Bonaventure during his lifetime did not hesitate to call him a saint immediately after his death. Rev. Dr. Vitali had been assigned to Albion with Raeville as a mission. But he was not wanted for some reason, and after about three months the parish was again without a pastor. One of the trustees petitioned the Bishop of Omaha and the Provincial Ferdinand Bergmeyer to again send a Franciscan Father, to take care of Raeville and, if possible, to found a friary there. The latter was out of question for lack of a sufficient number of priests. But Fr. Bonaventure returned once more to his former charge about April, 1888. That you may know something about our standing here, I deem it not inappropriate to address your Grace a few lines.--The building of a new church is making slow progress. The building committee appointed by our late pastor, Rev. F. Bonaventure, O. S. Fr. consisting of Messrs. Heim, Moser, Lordeman, Pfeifer, Schroeder and Rueth, have, with the exception of Pfeifer, unanimously decided to borrow $1,000 on their own account and to commence building as soon as the weather will allow, provided the church be moved a mile northwest, near the railroad track. The reasons why the committee deem it advisable to build in said place (SE 1-4 of SE 14 of Sec. 1, R. 7, and 22) are several: the town Petersburg and vicinity is being rapidly settled already by the Catholic people, there being already over one-half dozen Catholic families right in town; the number of Catholic families in the vicinity of Petersburg is increasing rapidly, Protestants selling out; and if the increase continues thus, Petersburg will be able to support a priest, build a church, etc. Now if the church were removed more to the northwest it would leave a large radius for Petersburg, as well as St. Bonaventure which is now only a little over three miles from Petersburg. And as St. Bonaventure continues to extend to the north, the church would in the future, if removed, come nearer to the center. Further if the church be removed towards the railroad track, there would, probably, be no difficulty in obtaining a flag station, post office, and, no doubt, a kind of station would develop. And lastly, the church would be situated on a public cross road and more convenient of access. Mr. Henn, on whose place the committee would wish to build, is willing to give (as I understand) several acres free, or sell ten acres at a low nominal price. If the committee could obtain permission to build on the place selected, a large church (32 x50 would soon be erected, pews could be rented and the income for the priest's salary, etc. would be placed on a firm basis; in short, the whole congregation would, as well as I can see, be greately (sic) benefited. Fr. Bonaventure erected the second church in 1888-1889.
came, severely reprimanded the people that they were undeserving of such a holy pastor while the author of the letter, so it seems, was busily paging his musical notes. Calm reigned for some time after this. When Fr. Bonaventure was relieved of the Raeville and Madison missions, he was succeeded by Rev. Marcelline Kollmeyer at Madison and Raeville. His residence was at Humphrey, whence, after the completion of the Scribner-Oakdale division of the railroad, St. Bonaventure's could be more easily attended. In the new church the Stations of the Cross were again canonically erected October 9, 1889. 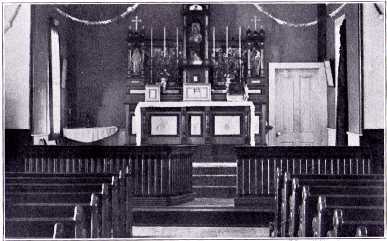 In the following year new pews from the work shop of Henry Schenck at Quincy, Illinois, were installed (cost $158.75). A belfry was also erected (probably in fall, 1890) and two bells were blessed with Episcopal approval by the Rev. Godfrey Hoelters, O. F. M., who was assisted by the pastor and the Rev. James Nolte, O. F. M. The smaller bell was a gift of Mr. Rueth, the larger of the parish. A holy mission was preached during R. Marcelline's rectorship by two Franciscan Fathers. As the mission of St. Bonaventure at Raeville had gradually increased in numbers since October, 1887, when it numbered fifty-one families (289 souls), one hundred and eleven adults over 21 years old being practical Catholics and one hundred and seventy-three being under 21 years of age; with 160 Paschal and no first communicants; 18 baptisms; no marriages; 3 deaths (2 children and one adult) to a considerable parish of ninety families. The people began to desire a resident priest, as the Franciscans did not think of erecting a monastery at Raeville, the people requested the Rt. Rev. Bishop when his Lordship came October, 1891, to administer the Sacrament of Confirmation at Raeville, to send them a resident pastor. The Rt. Rev. Bishop complied with their petition and sent the Rev. John Mueller. But let him tell his own story. "When I visited Omaha (in summer 1892) the Rt. Rev. Bishop bid me stop at Columbus and inform Rev. Pacificus Kohen, O. F. M., that I had been appointed resident pastor of Raeville. 'Every fool (Geck) can claim such a thing. Have you any papers?' was the gruff retort. I replied: 'No, I have not.' Fr. Pacific walked up and down for a while, bade me remain till tomorrow, donned his civics and took the train to Omaha, whence he returned late at night. Next day he informed me (Father Mueller), 'Let him who takes the cow, also take the calf, meaning let him who takes care of Raeville, the larger parish, also take over the smaller one, St. Edwards.' This had been the object of Father superior's trip to Omaha. Fr. John Mueller thus became pastor of Raeville and St. Edward. Fr. Mueller met Fr. Marcelline at Albion and got off at Petersburg, where a farmer who had hauled hogs to the market took the two priests and the housekeeper, Margaret, to Raeville. There Fr. Marcelline introduced the new pastor and then withdrew." As there was no pastoral residence, a barn or stable was cleared and the housekeeper slept there while Father Mueller lodged temporarily (August 18-December, 1892) in the room back of the church, in which the Franciscan Father had lived. Work on the parsonage commenced in October and was completed in December. 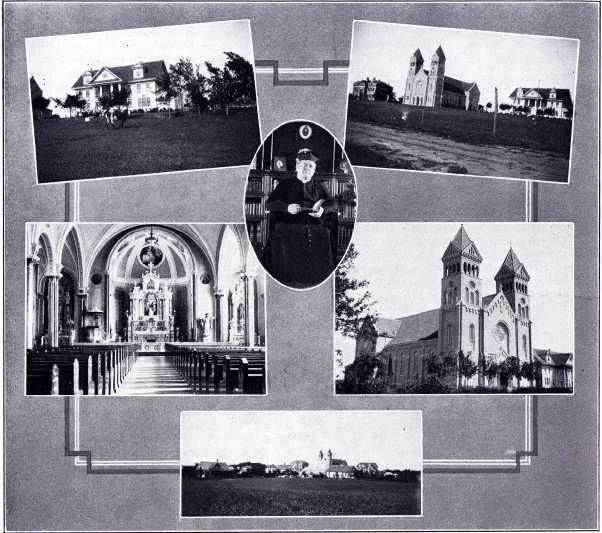 The construction of the parochial school commenced in May, 1893, and September 4th of the same year it opened its doors with the Venerable Sisters of St. Joseph from Concordia, Kansas, as teachers. This gave a new impetus to the growing parish. Soon the former Methodist church at Petersburg was purchased and sixty families formed the congregation of St. John the Baptist. The church was dedicated by Rt. Rev. Bishop R. Scannell on June 18, 1896. Rev. Anthony Birnbach, assistant to Fr. Mueller, took charge in 1896, and in 1898 Rev. Einnig became the first resident pastor of St. John's at Petersburg. When the Raeville church soon after proved again inadequate to hold the large number of worshipers Fr. Mueller organized forty families near Elgin into St. Boniface parish. Rev. Adam Brass, assistant at Raeville, took charge of St. Boniface in December, 1900, and became its first resident pastor in October, 1901. In 1900, Fr. Mueller built an addition to the Raeville church at an expenditure of $2,000.00. In the same year the new high altar and the communion rail (from Dubuque) were installed at Raeville (price $500). In October, 1902, Rev. John Mueller was transferred to St. Helena. Rev. John Mueller was born at Wallendorf, Kreis Bitburg, Regierungsbezirk Trier (Treves), in the Rhenish Province, Prussia, on April 15, 1854. His parents were John M. and Barbara Kuenen Mueller. After absolving the elementary school, he remained at home about a year to help somewhat in the blacksmith shop or farm, but was more fond of books than work. From 1869-1876 he attended the gymnasium at Treves to unterprima inclusively. With lack of funds, his universities studies still ahead of him and with no prospect of obtaining a parish after ordination owing to the so-called "Kulturkampf", our student resolved to complete his studies in America and labor there in the Lord's vineyard. On Steptember (sic) 22, 1876, he entered the Salesianum or Priest's Seminary near Milwaukee, Wisconsin, then having for its rector the well-known Rev. Christopher Wapelhorst (later known as P. Innocence, O. F. M., author of the Compendium Liturgiae). On June 27, 1880, his class of twenty including Fr. 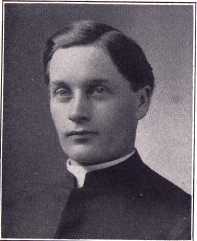 W. Wolf (Grand Island) were raised to the dignity of the priesthood by the Rt. Rev. 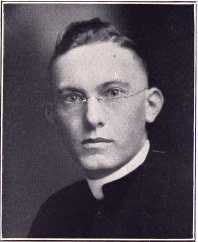 M. Heiss, D. D., Bishop of La Crosse. Father Mueller first served as assistant to Rev. J. Jennette at Exeter. At the end of the month the pastor paid Fr. Mueller his salary--one silver dollar, which he treasured to the day of his death.